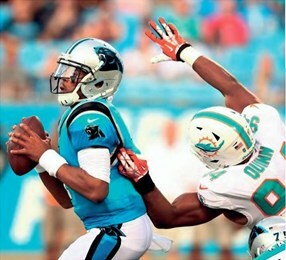 DAVIE, Fla. (AP) – Adam Gase says the Miami Dolphins’ run defense will be better than last year. The preseason says otherwise. Miami has allowed 299 yards rushing in the first two exhibition games. That includes 226 yards Friday at Carolina, and 71 on one play – a touchdown run by Christian McCaffrey on the second snap of the night. Langford joins a group of tackles that also includes veteran newcomer Akeem Spence, perennial underachiever Jordan Phillips and two players taken on the final day of the 2017 draft, Davon Godchaux and Vincent Taylor. New defensive line coach Kris Kocurek plans a heavy rotation to keep everyone fresh.